Five years ago, an apocalyptic storm of biblical proportions rained down on the gulf coast. My friend, Dr. Russ Moore remembers his hometown of Biloxi and traces the connection between Christ and Katrina, giving a strong theological framework to demonstrate how the smoldering remains and deep scars in the landscape groan for the day of redemption and serve as sign posts of repentance pointing to the risen Christ. I can feel his pain as he explains his first trip back to the gulf coast. His feelings mirrored my own first walk through the rubble of our destroyed church buildings. Dr. Moore provides the best biblical treatment of the storm I’ve read so far. Let me urge you to read the full article. He says it better than I can. I always feared seeing my hometown turn into Armageddon, and five years ago, sure enough, that’s just what happened. As a small child, I would sit in the pews of my church and imagine, as our pastor flipped through one apocalyptic scenario after another in his prophecy charts, what our town—Biloxi, Mississippi, on the coast of the Gulf of Mexico—would look like after the seals of the Book of Revelation had been opened, after all hell broke loose on the world as we knew it. That really didn’t comfort me, though, as much as they thought it would. Yes, my raptured soul would be safely sequestered in heaven, while tsunamis and locusts and horse-riding specters ravaged our hometown, but it would still be gone, washed away in a flow of blood and debris. I would be exiled from it. And home would be taken away from me—forever. I knew I wasn’t supposed to think that way. This world is not our home, you know. We are citizens of heaven, resident aliens here for a vapor. But, still, the idea of my little beachfront community buried beneath the collapse of unbelieving civilization was hard to take, so I tried not to think about it, focusing instead on the scenarios the preachers actually talked about: the sudden evaporation of New York or Washington or Hollywood or Rome, all those Babylons that, we were told, were exalting themselves against God, and corrupting our values with prayerless schoolrooms and primetime soap operas and heavy metal music and nuns (though with a half-Catholic family, I never believed that last part). I outgrew the dispensationalism (while holding onto the gospel underneath it all), but I still lived to see my hometown face an apocalypse. And rather than watching it all helplessly from a cloud in heaven, I had to watch it all, even more helplessly, on CNN. 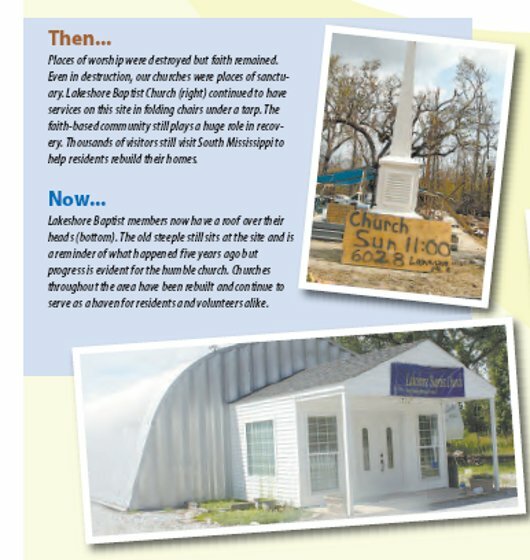 This months “Today in Mississippi” magazine featured Lakeshore Baptist Church in its “Hurricane Katrina: Then and Now” story. “August of 2005 began like any other hot, lazy summer month in South Mississippi. Area residents fished and swam and complained about the heat. Children squeezed as much as they could out of the last few days of summer before heading back to school with freshly sharpened pencils and brand new notebooks. At the end of the month, there was talk on the news about a storm heading through the Florida Keys and coming into the Gulf. That storm soon became a monster of the likes that few had ever seen. “Preparations were made, windows were boarded and stores were packed with people refreshing their disaster preparedness kits. But still, none of us knew. None of us really knew how our lives would change that day. 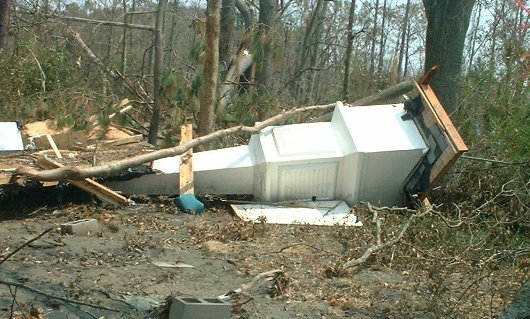 Hurricane Katrina changed the landscape of South Mississippi and the hearts and minds of its people forever. services on this site in folding chairs under a tarp. The faith-based community still plays a huge role in recovery. 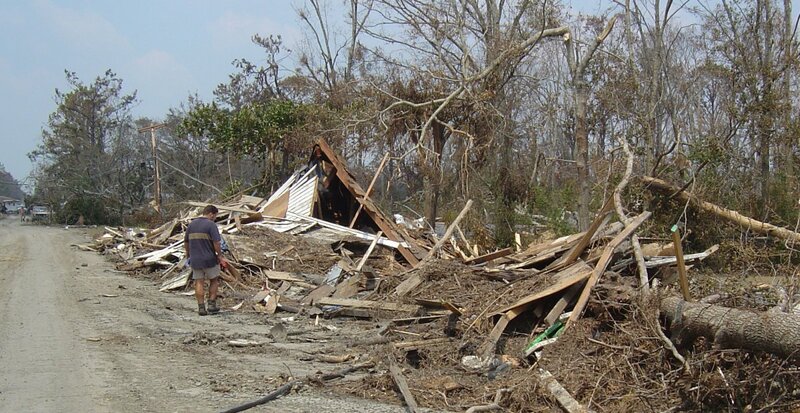 Thousands of visitors still visit South Mississippi to help residents rebuild their homes. progress is evident for the humble church. 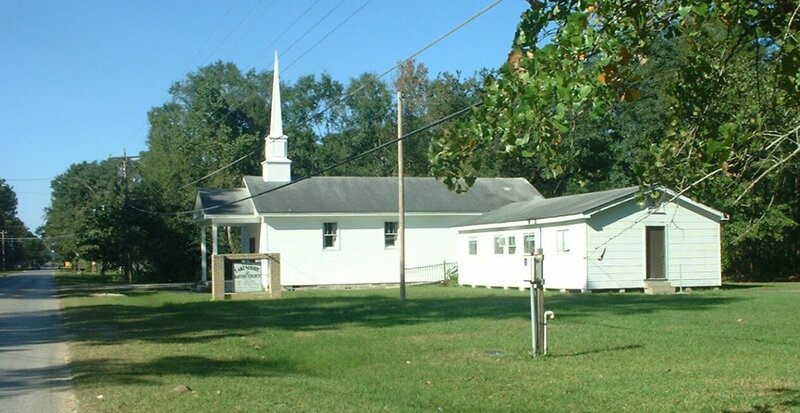 Churches throughout the area have been rebuilt and continue to serve as a haven for residents and volunteers alike. You can download the pdf and read the full story @ Today in Mississippi – August 2010. The Lakeshore Baptist Church distribution center ministry serves as a conduit of hope funneling donations to those in need across Hancock County MS. 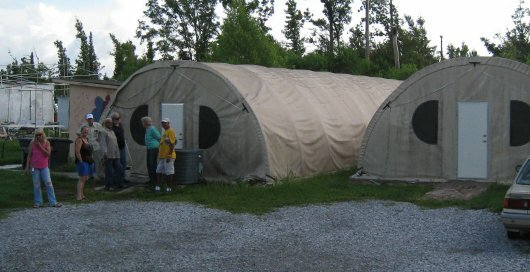 Currently operating out of temporary quonset huts and make-shift storage sheds, eventually we look forward to moving this operation to the Mercy House; now under construction. Open Wednesday through Friday from 9:00 am to 3:00 pm, roughly 300 families in our community turn to this source of help every week. For those wishing to contribute to this cause, our greatest needs include non-perishable food such as canned goods, men’s and children’s clothing, baby items, and furniture. Please continue to remember us in prayer as we seek to exalt Christ through word and deed on the gulf coast.